Oil price forecasts are wrong. That’s not going to change. Today’s Alberta budget has one in it, it’s aggressive, and it will be wrong. Will it be proven to be too high or too low? I haven’t a clue. But, in a province where approximately 1/3 of future provincial revenue depends directly on energy prices, their derivatives, and production quantities, forecasts are crucial and should be scrutinized. More than whether they are right or wrong, we should ask whether the forecasts are based on the best available information. Alberta expects significant increases in resource revenue. As you can see from the figure above, non-renewable resource revenue is expected to increase from $9 billion to over $15 billion per year between now and 2014-2015. Notably, the key constituents of provincial resource revenue have changed markedly in the last few years. In 2005-2006, natural gas royalties exceeded $8 billion, with production at about 4.9Tcf. Today, production is down about 20%, but royalties are down to about $1 billion per year and are not expected to climb above $1.5 billion per year over the next 3 years. Oilsands have followed the opposite path – royalties collected on bitumen and synthetic crude were less than $1 billion per year in 2005-2006, and are expected to grow from $3.7 billion in 2010-2011 to almost $10 billion in 2014-2015. Oilsands production is expected to reach 2.4 million barrels per day by 2014-2015, up from a little under 2 million barrels per day today. The key factors which will determine whether these forecasts hold true will be North American oil and gas prices – the price for natural gas at the Henry Hub in Louisiana and its derivative in Alberta (AECO-C), as well as WTI oil at Cushing, and related prices for light and heavy oil products in Alberta. So, what are these prices going to be and is the government right? Far be it from me to say. If I were asked to predict it, I’d rely on the the futures market. Today, the market believes that a claim on a barrel of WTI delivered to Cushing in September of 2014 is worth $97.41, and you can see in the figure below how those beliefs have changed over the past year and a bit. If you believe that oil will be worth a lot less than that, you’d want to be on the sell side of as many of these contracts as possible, since you can collect your money today and buy cheaper oil in the future to fulfil your obligations. If you believe oil will be going up well above that price, you could buy futures contracts today as a means of savings, expecting to be able to sell the claim on that barrel for a lot more sometime between now and the delivery date. The futures clearing price reflects the best estimate we have of market expectations of the cost of a barrel of oil in the future – if it didn’t, people would buy or sell futures, and the price would change. Take all the futures prices looking forward 3 years and you’ve got a futures curve, what is likely the best snapshot of expectations of future oil prices you can get your hands on. Generally, when oil companies report reserves, this is what’s behind the curtains, at least for the first 36 months. So, what does the market say? It says the government is too optimistic about oil. 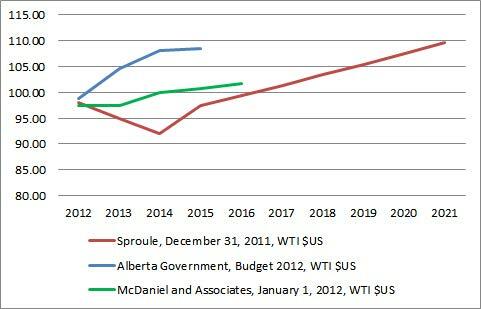 Sproule Associates Limited provides a forecast for which the first 3 years of data are based on the futures curve, which is shown above, along with the calendar year prices from the Alberta government’s forecast and the forecast used for reserve evaluations by McDaniel and Associates. I’ve used Sproule’s December 31st forecast because that’s what is referenced in the 2012 budget. As you can see, market expectations are significantly different from the Alberta Government’s expectations, although it’s important to note that many of the private sector forecasts cited in the Budget are more bullish than the government’s forecast. It’s not possible to say that one is right and one is wrong, but you can say that only one is based on the outcome of a competitive market in which you can only participate if you’re willing to put your money where your forecast is. Interestingly, while the oil price view in the Alberta budget is significantly different from the futures curve, the natural gas view is within $0.01/MMBtu on average over the next 3 years with less than 10% difference in any individual year. Since oil prices are the main driver of the budget, let’s look more closely at them. WTI prices impact Alberta budget numbers in three ways. First, the obvious one. Since almost all Canadian oil exports flow into markets in which the benchmark price is set by WTI, the prices for light, synthetic, and heavy oil as well as bitumen at trading points in Edmonton and Hardisty will be determined relative to WTI. The higher is WTI, the higher are revenues from all oil production in Alberta, all else equal. Second, the only slightly less obvious. Since Alberta’s oil revenues come, in part, from new production, we need to consider the role that robust prices play in determining growth, and the role that growth rates play in both total revenues and in determining the costs of other projects. Finally, the least obvious. Alberta’s oilsands royalty rates are determined by WTI prices – until project costs have been recovered, gross revenue royalty rates range from 1% when WTI is at or below $55 per barrel to 9% when oil is priced at $120 per barrel or more. For post-payout projects (which more projects are moving in to now), royalty rates charged on net revenue are 25% when WTI is at or below $55 per barrel, but increase up to 40% when oil is priced at $120 or more. Higher prices mean that projects pay out more quickly and royalty rates on every barrel of oil produced are higher. These numbers can make a difference. Consider the 2014 projections for WTI prices. At the Government’s projections of $108.07/bbl, the post-payout net revenue royalty rate would be 37.25%, while the futures market projections would imply a royalty rate of 33.54%. Assuming a WTI-bitumen differential of $22/bbl and attributable operating costs of $30/bbl, the government’s forecast would predict $20.89/bbl in royalties while the Sproule forecast amounts to just $13.41/bbl in royalties, a 36% reduction. Under the pre-payout royalty, the Government’s forecast would imply $6.48/bbl, while the futures prices would imply $3.89, a 40% reduction. There would also be lower tax revenues associated with the lower price forecast, with less after-royalty profit available for taxation. Bottom line -this is a potential $2-3 billion/year discrepancy, if the market is right about future prices. So, what do you take away from this? If you’ve made it this far, I expect you’re now ready for a good night’s sleep. Beyond that, remember that all forecasts are wrong and the stakes are immense for Alberta. Demand from the government, and from the opposition budgets which will come out over the next couple of days, the best support they can provide for that most important of numbers in Alberta – the price of oil. Finally, you should thank me for writing an entire post about futures curves without using the words contango and backwardation repeatedly, despite them being my two favorite words in economics. Interesting stuff. I have become skeptical of futures markets since reading Alquist and Killian (What Do We Learn from the Price of Crude Oil Futures? , Journal of Applied Econometrics, 25(4), June 2010, 539-573.). They claim a random walk is a better predictor of oil prices than futures markets. So in other words, the best predictor is the current price. Of course the error bands will be very, very important. Thanks for this excellent explanation of the sensitivity of the revenue projections to the price of oil. The Alberta forecast has a big upward spike over two years but then flattens out in the last year. How did they come up with that? The middle curve (McDaniels) seems to imply even a slow rise would eat away most of the $2-3 B/ year differential you found. I wonder how long it will take Wildrose to link to this. It puts forward a pretty powerful case that the government’s revenue projections are at best wildly optimistic. Thanks. Their specific methodology, at least as far as I have seen, is proprietary. It’s really close to an “average” forecast which they show in their revenue document for the budget. More than anything, I think the thing people need to see is just how sensitive the revenue forecasts are to the price of oil and gas. This is great Andy. I believe useful lessons learnt from history is that those in authorities should always moderate puplic expectations.